The government decided to draw constituency boundaries on the basis of an electorate that is far lower than it should be. In 2015, 600,000 people dropped off the electoral register following the government’s rushed move to individual electoral registration, against the advice of the Electoral Commission. We saw a shocking 40 per cent drop in 16- and 17-year-olds registered to vote nation-wide. Since 2015 over two million people have registered to vote, following a spike in voters from the EU referendum and 2017 general election. In a climate where trust in politicians is at a historic low, we must harness this energy and reinvigorate our public debate. My private members’ bill, which will have its second reading today, will seek to do just this, by including these two million people, and retaining the best parts of our democracy. My bill proposes four other changes: it retains the number of MPs at 650; reviews the boundaries every ten years; ensures that all constituencies have the same number of voters within a margin of 7.5 per cent; and fixes the number of constituencies in Northern Ireland at 18. The balance between parliament and the executive is essential to a functioning democracy. We cannot reduce the number of MPs without reducing the record number of ministers we have at the moment. As we deal with Brexit, and scrutinise the most important constitutional change in decades, the need for independent minded, backbench MPs is more important than ever. 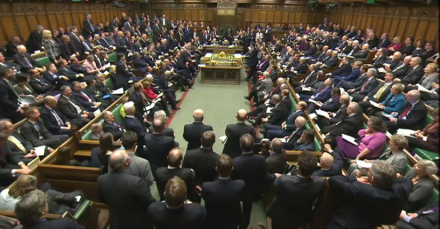 The government says it is reducing the number of MPs to save money. At the same time they have bloated the unelected House of Lords with 260 appointments since 2010. This is costing £34m per year, by the way. We cannot justify reducing our elected representation while increasing the unelected Lords. The MP-constituency link is a unique and fundamental part of our democracy. Five yearly boundary reviews, as the current law provides for, would weaken this link. The shape of a constituency may change at every election, resulting in MPs being less accountable to their electorate. The current boundary review’s strict adherence to the number of electors in each constituency – above geographical or community borders -has produced some bizarre results. Take Crawley, a constituency which hasn’t changed since 1997. It is currently only 453 voters below the threshold, so a ward has been added from another borough, on the other side of the motorway. If we relax the quota to 7.5 per cent, we can strike the right balance between delivering the government’s aim of equally sized constituencies, and allowing constituencies to reflect communities. Finally, there will always be exceptions. Northern Ireland has a special status in many parts of our law. Brexit has already introduced enormous uncertainty, and given that they have a relatively small representation at the moment, it is sensible to provide some stability going forward by fixing the number of MPs in Northern Ireland at 18. I am optimistic about my bill’s chances. I have deliberately drafted it in a way to build cross-party support. I owe an enormous amount to Pat Glass, who had a private members bill very like mine in the last parliament. She raised awareness about this issue, galvanised public support and engaged with all parties to shape with Labour’s position. I am proud to continue her work, and hopefully finish what she started. Afzal Khan is MP for Manchester Gorton.